It's a simple task: Carry the seltzer can outside to the trash can. This is not something that Lynne Enman can do right off the bat. She has to plan it out. She usually takes her power chair, but she hasn't done any walking today, so she really only has to decide whether it will be one crutch or two. She settles on the single, leaving her other hand free to grasp the can as best she can. "I only have two speeds: slow and not fast at all," she says cheerfully as she shuffles at a snail's pace. Through the years, Lynne has become an expert at thinking ahead. 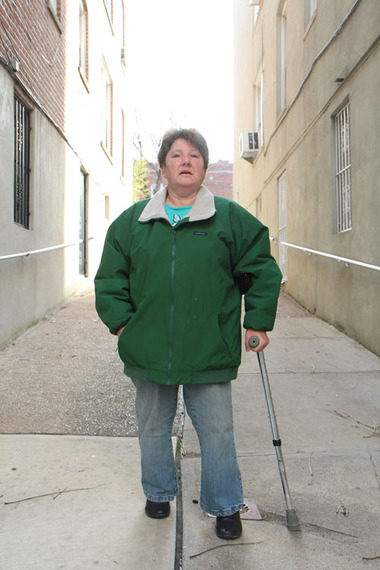 Lynne doesn't let crutches stop her. 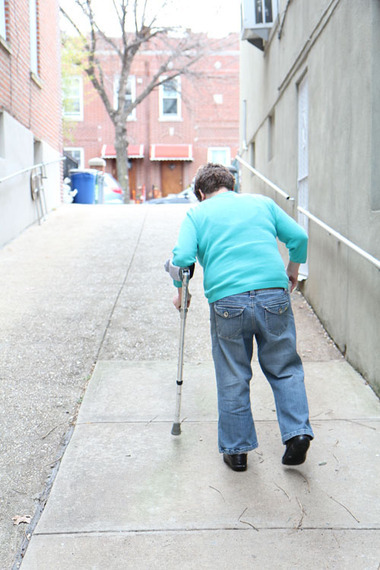 She moved into this basement apartment 18 years ago, long before she needed the chair or the crutches, because it has a steep ramp that goes from the door straight to the street. Lynne has Turner syndrome, a chromosomal condition that has left her short of stature and long on living life to the fullest. She was 14 when she got the news. By 16, she had developed psoriatic arthritis, and by 20, she added diabetes to her list of ailments. But her painful symptoms began much earlier. Lynne was born and raised in Worcester, Massachusetts, where she and her family, which included her younger sister, lived in a suburban ranch house. 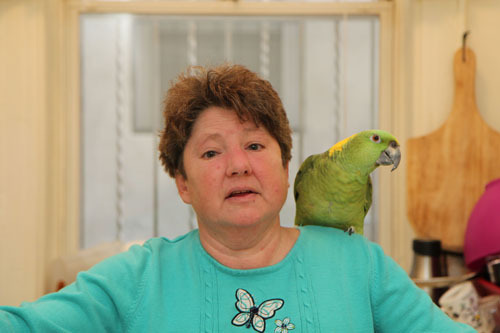 Jiminy is Lynne's therapy parrot. At an early age, she developed a love for music that could only be satisfied by playing an instrument. She had her heart set on the flute or clarinet, but fortuitous circumstances led her to the oboe, a double-reed woodwind that is about half her height of 4.5 feet. "I envisioned a career in music or the music industry," says Lynne, who holds bachelor's and master's degrees in the subject. As many performers do, Lynne spilt her time between the stage and the office, working in administration for The Metropolitan Opera and playing in various orchestras and chamber music groups. In her free time, she coached younger players. She traded her longtime Met desk for one at the American Society of Composers, Authors and Publishers, where she worked for some two decades. 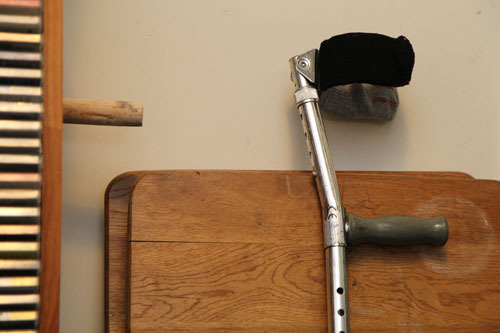 Crutch and perch go hand in hand. She had to stop using the subways a decade ago, getting to work via Access-A-Ride and telecommuting a couple of days a week. Around the house, she began using crutches then graduated to a scooter and finally, last year, the power chair. "Arthritis is a progressive degenerative disease," she says matter of factly. "I had to stop playing the oboe seven years ago. I miss it, but I do a lot of listening, particularly jazz, chamber music and classical music." Lynne looked forward to going to work, which is why she was so shocked and saddened when she lost her job nearly four years ago. "About half the people in the department, including my boss, who was extremely supportive of me, were downsized," she says. The kiss of a parrot. 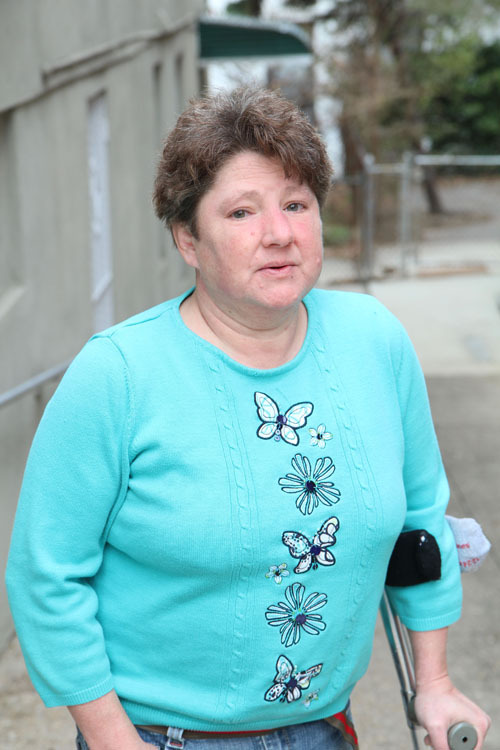 When she failed to find employment, she went on Social Security disability and turned to volunteer work, donating her time to a variety of nonprofits, notably the Arthritis Foundation, where she is an ambassador advocate. "This is a great way for me to help other people, and it's a good coping mechanism because it gets me out of my self and keeps me informed about the progress of research," she says, adding that she has represented the foundation in Albany and Washington, D.C. Still, Lynne finds she has time on her hands, which refuse to work the way she wants them to. Lynne uses the power chair for trips around the neighborhood. She drives around the neighborhood in the power chair. "I named it Martin Luther King because it sets me free," she says and laughs. 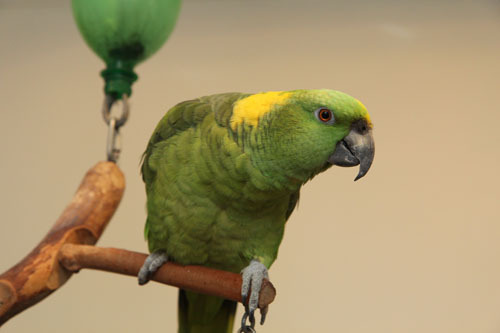 Jiminy Cricket, her 14-year-old Amazon parrot, rides on her shoulder, wisecracking along the way. "The Bird Lady of Astoria," as everyone calls her, has been known to drive her chair all the way to Astoria Park, which is about 5 miles from her apartment. It's no big deal , she says, because the chair can go 15 miles without a recharge. She also spends a lot of time at McDonald's and Starbucks and goes to the New York Botanical Garden and the Bronx Zoo to take photos with her Canon Rebel. Lynne likes to make light of her chair, hanging witty signs on its back. 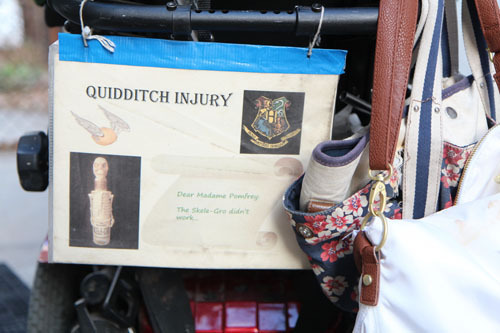 A Harry Potter fan, one of her favorites is "Quidditch Injury." "Jiminy and the signs are icebreakers," she says. "People see them and see the chair less so it lessens their discomfort." 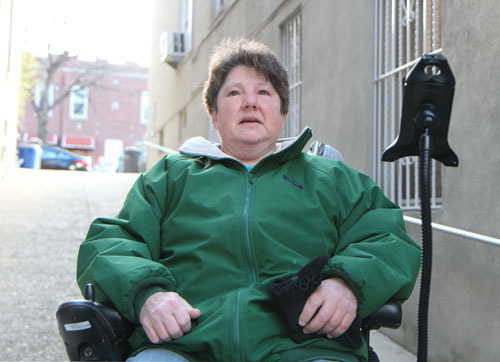 Lynne has no quibbles about calling herself disabled. She's looking for a part-time job. "It's a fair word," she says. 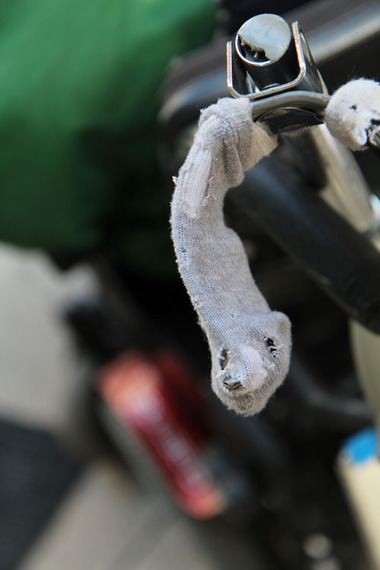 "I have some physical limitations, but they don't limit my life. People disable me more than my disability because they think I can't take care of myself, and when they see me, they assume I have a chaperone so they ignore me." Lynne, who is 52, does all right by herself. For the most part, she is able to take care of herself and Jiminy Cricket. "Friends sometimes come in to help me," she says. "I don't ask for help a lot because I don't' need it." 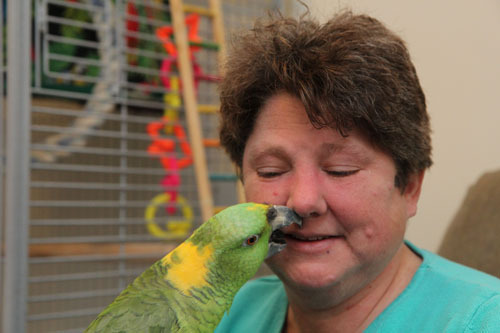 Jiminy, aka her "feathered child," serves as her therapy bird. The crutch, one of Lynne's lifelines. "When my blood sugar gets low, he detects it, sometimes before I do," Lynne says. "He rubs my cheek or nips at me and says, 'It's OK, you're all right.'" Jiminy lives in a metal cage that takes up most of the living room and is about two feet taller than Lynne. "Parrots need a lot of care," she says as she slowly bends down to clean the plastic under his rolling roost. "They need attention and social interaction. If they don't get enough, they pull out their feathers." No way is Lynne giving up. There are many things Lynne has had to give up, but faith in the future is not among them. "I would like to find a part-time job," she says. "I see myself doing a lot more health-care advocacy, and I'm thinking about going back to school to get a degree in it." As she does with everything else, including walking up and down the ramp to her apartment on crutches, Lynne will take her time to decide.